This gig is for a seated audience. The music of Pink Floyd as it was meant to be heard. Pink Floyd’s recording career spanned almost three decades and, for its 10th Anniversary, The Floyd Effect has chosen two of the band’s most remarkable albums to create The Bell And The Moon tour 2018. Spotlighting the music of The Division Bell (1994) and a complete, unbroken performance of the iconic Dark Side Of The Moon (1973), concerts will also include tracks from Wish You Were Here, Animals and The Wall, delighting Pink Floyd fans everywhere. The Floyd Effect is renowned for the remarkable accuracy with which it performs the music of Pink Floyd. All of the band’s members are top quality musicians with pedigrees that stretch across all manner of musical genres, and they faithfully recreate the music and intensity of a Pink Floyd concert without recourse to backing tracks, racks of computers, or other technological wizardry. Every note that you hear is played and sung by the band, making each concert a genuine ‘live’ experience; powerful, immersive and emotional. And, of course, the music is supported by a dramatic light show that incorporates the iconic circular screen, two sets of projections, smoke and lasers. 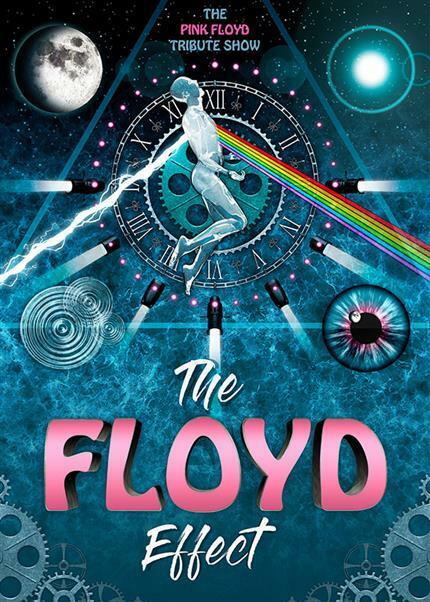 Sit back and enjoy The Floyd Effect as the band takes you on a journey through the music of Pink Floyd. Unless you were there the first time around, it was never as real as this. Doors open 7pm, show starts 7.30pm.